Search the entire B&C Records Book dating back to 1830 – Online! After much anticipating, planning, data entry, and testing, the Club has launched Trophy Search. Yes, the information super-age has caught up to records keeping in a way that will satisfy even the most dedicated researcher of trophy data and statistics. Trophy Search now includes links to thousands of field photos and portrait photos. New photos are being added on a regular basis. 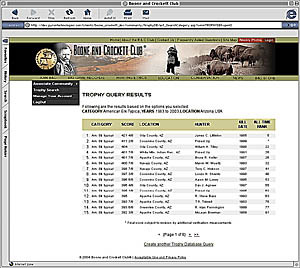 This new database is the complete collection of all Boone and Crockett trophies in 38 categories from the beginning of recorded trophies to date (1830 - through today). Data searches can be queried in a number of different ways depending on the type and amount of information in which you are interested. It is set up by species and you can ask it to search for trophy listings by a specific year or range of years; by state, county or province; or by the hunter/owner’s last name if you are looking for one particular trophy. To sign-up for Trophy Search, visit the Clubs web store today.